NEW ORLEANS (AP) The Toronto Raptors were pummeled in the paint and turned the ball over too often. The way DeMar DeRozan and crew were shooting, it didn’t matter. DeRozan scored 25 points and the Raptors shot 59 percent from the floor to beat the New Orleans Pelicans 125-116 on Wednesday night. Toronto made 47 percent of its 3-point attempts, and seven Raptors had at least 10 points. Among them were Kyle Lowry with 22, Jonas Valanciunas with 21 and C.J. Miles at 17. ”Coaches are preaching, `When you’ve got open looks, take them and be aggressive in all the things you do,”’ Lowry said. Miles made five 3-pointers and Lowry had four. DeRozan, Serge Ibaka and Fred VanVleet each had two. DeMarcus Cousins scored 25 points for the Pelicans, and Anthony Davis had 19. New Orleans outscored Toronto 64-42 in the paint and won the turnover battle 21-14 but couldn’t slow the Raptors’ sharp-shooters. The Raptors won for the fourth time in five games. The Pelicans lost for the second time in their last seven games. Toronto turned a one-point halftime edge into a 98-86 lead after three quarters, boosted by DeRozan’s 11 points. Lowry scored on an offensive rebound and Miles made a 3-pointer as Toronto extended the lead to 110-93 early in the fourth. The Pelicans led by 14 points in the first quarter. Pascal Siakam scored 10 points, all on layups, as Toronto took a 45-42 lead early in the second quarter. Jrue Holiday scored eight points as New Orleans regained the lead before Lowry made a 3-pointer that gave the Raptors a 64-63 halftime advantage. Raptors: The Raptors were playing the back end of their first set of back-to-back games this season, having won at Houston on Tuesday. 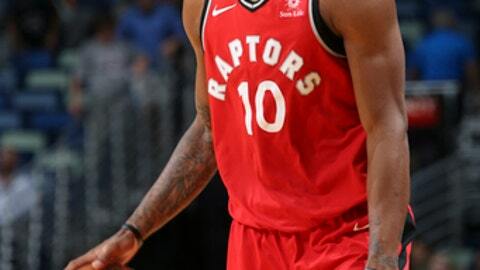 … The Raptors defeated the Pelicans 122-118 last Thursday in Toronto. … G Norman Powell missed his second consecutive game because of a hip pointer. … Toronto made all 14 of its free throws. Pelicans: G/F Tony Allen missed his third consecutive game because of knee soreness. … New Orleans shot 50.5 percent from the floor, its franchise-record fifth consecutive game of shooting better than 50 percent. … Cousins and Davis both committed two fouls in the first quarter and finished with five each. … New Orleans made 19 of 20 free throws. Pelicans G Rajon Rondo made his first start of the season. He returned from preseason surgery to repair a core muscle injury to make his debut against Atlanta on Monday, coming off the bench to play five minutes. Against the Raptors he played 14 minutes and had four points and eight assists. Raptors: Home vs. New York on Friday night. Pelicans: At Denver on Friday night.